Located northwest of downtown Saint Paul, the area known historically as Frogtown includes several smaller neighborhoods: Mount Airy, Capitol Heights, Rondo, Lower Rice Street and East Midway. 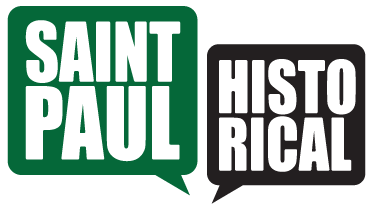 The Burlington Northern Santa Fe (BNSF) Railroad tracks, Interstate 35E, University Avenue, and Lexington Parkway are borders of the Saint Paul planning district called Frogtown, but the historic neighborhood boundaries extend south of University several blocks. The planning district, which is now Frogtown Neighborhood Association, took shape when the City of Saint Paul founded the district council system in 1975. One story is that then-Archbishop John Ireland, hearing a chorus of frogs here, referred to the area as “Froschberg” or Frog City.” That story is likely because Frogtown, like many other Saint Paul neighborhoods, had several swamps and marshes. Those were filled in and developed over time. The name Frogtown dates back to the 1860s and 1870s. Father Alexis Hoffman, an early neighborhood historian, states that the area bounded by University and Western avenues, Rice Street and what was Carroll Avenue (now part of the Saint Paul College-Christ’s Household of Faith property) was called Froschenberg or Frogtown because of its swamps, according to Hoffman. Frogtown's first homes dated from the mid-1850s. It is one of the earliest first-ring neighborhoods around downtown. Generally, Frogtown neighborhoods developed in an east to west pattern, with the Mount Airy and Capitol Heights areas filling in first, and the East Midway area between West Minnehaha Recreation Center and Lexington Parkway filling in last.